from my recent trip there. Did you miss Carfree Times #71? There were problems with the e-mail announcements of Carfree Times #71. If you missed it, you can read it now. 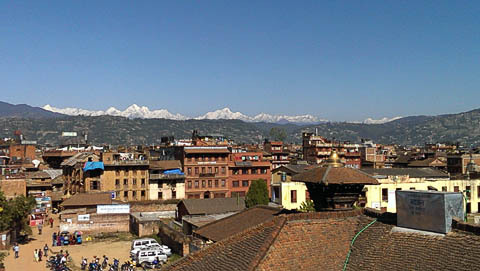 RECPHEC, a Nepali NGO located in Kathmandu, has agreed in principle to host the Carfree Institute in Bhaktapur, Nepal. 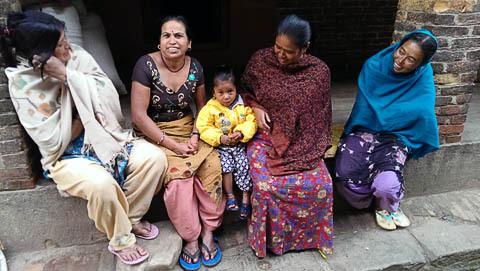 RECPHEC's Executive Director, Shanta Lal Mulmi, believes that the work of the Institute will support RECPHEC's mission to improve public health through a variety of measures, most definitely including a reduction of the health impacts of the transport sector. 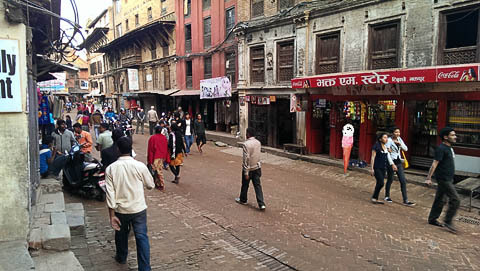 We will be helping RECPHEC to bring carfreedom to the Thamel area of Kathmandu. 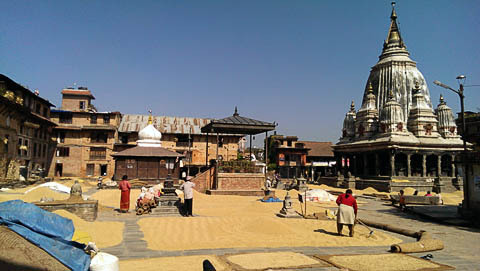 A colleague and I are in the process of moving to Bhaktapur. We plan to have the Institute up and running in the spring of 2014. New York repaves Times Square after deciding to keep it carfree. 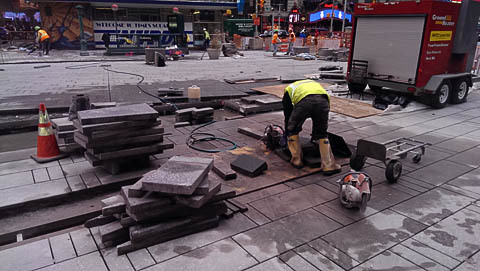 I brought RECPHEC Executive Director Shanta Lal Mulmi and his wife to see Times Square two weeks ago, and this is what we found. New York City is declaring the carfree change permanent by making suitable improvements to the paving. It'll be nice when it's done. 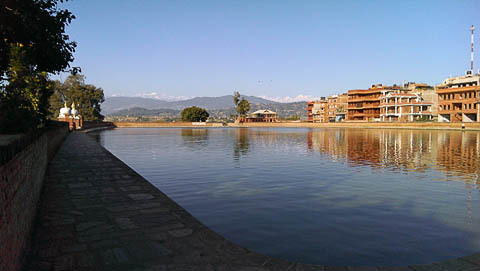 This perhaps surprising development follows a highly productive and enjoyable five-week visit to Bhaktapur this fall. 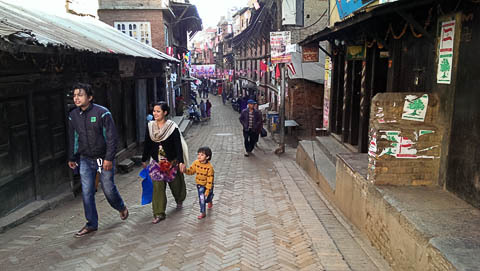 Bhaktapur, illustrated throughout this issue, is on paper a carfree city, and there are in practice not many four-wheeled vehicles on its streets. The issue of motorcycles is more serious, however. 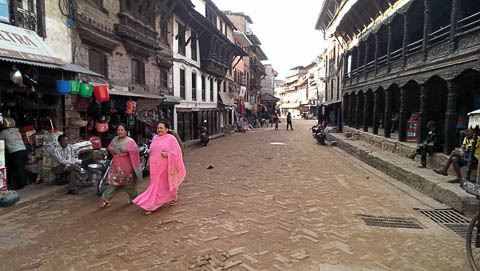 We will be working with the Bhaktapur Tourism Development Committee to try to tame motorized traffic on the city's streets. 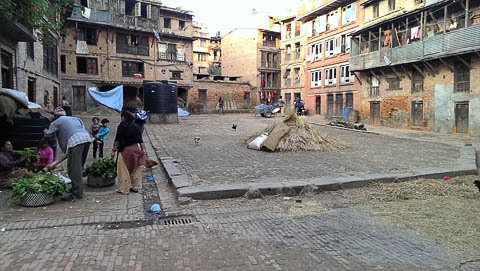 Bhaktapur adopted a policy of carfreedom about 15 years ago. 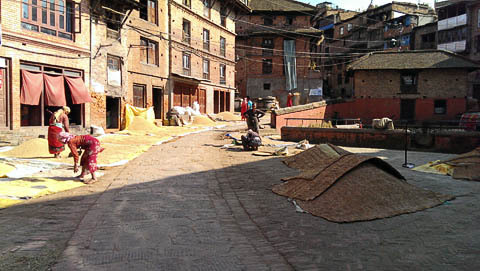 The city has also been the focus of major restoration efforts, spearheaded by German NGOs. The city is almost unique in the world, and it is a delight to use its carfree squares and streets. 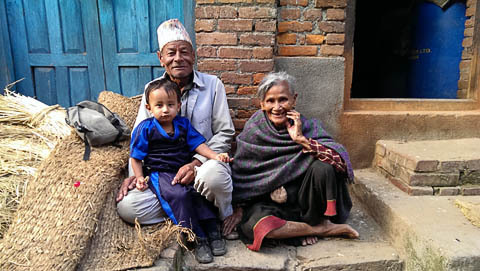 When you add the cheerful and friendly Nepali people to this wonderful environment, you have one of the magic places on the planet. 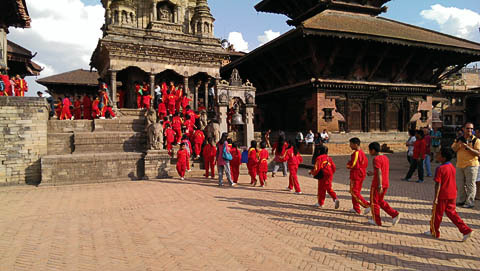 We will be starting on-the-job training with young Nepalis as soon as the Institute's doors open. As these young people build their skills, they will be making significant contributions to the work of the Carfree Institute. 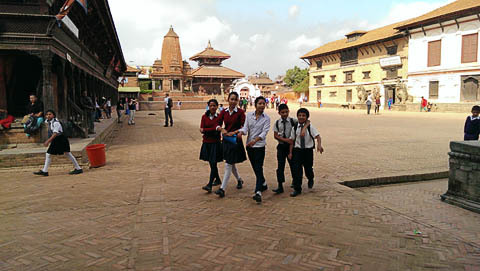 We will focus first on the situation in the Kathmandu Valley and especially Bhaktapur. As resources permit, the focus will be expanded to other parts of the world. The establishment of the Carfree Institute, a longstanding dream of the carfree movement, should help to reinvigorate the movement. I believe as fervently as ever that the carfree city is the cornerstone of a sustainable civilization. Special thanks to Debra Efroymson, a regular contributor to Carfree Times, for putting us in touch with RECPHEC. 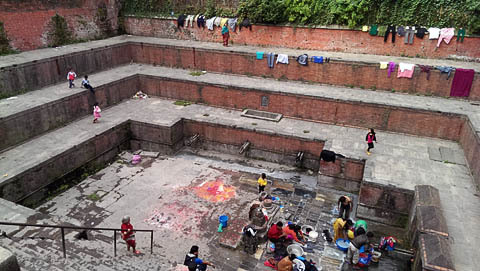 If you are in touch with anyone in the Kathmandu area, please send mail. 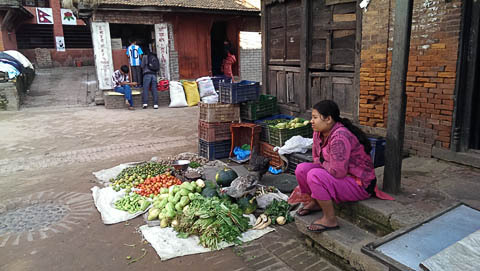 The next Carfree Times will come to you from Bhaktapur. Carfree Cities and Carfree Design Manual are widely available in Europe and North America. Carfree.com actively supports World Carfree Network (WCN). Unfortunately, WCN is largely inactive at this point. We hope to see a change in this situation before too long. Kelly Nelson is putting together an anthology of carfree poetry. Your submissions are welcome; deadline is 1 February 2014. 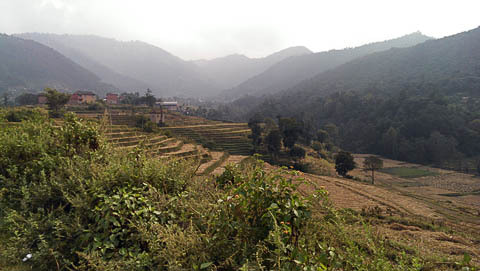 All the photographs below are from the Kathmandu Valley. 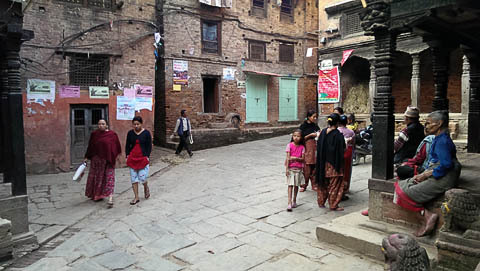 Most are from the city of Bhaktapur, soon to be the home of the Carfree Institute. 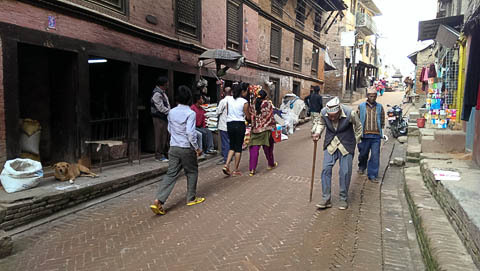 "Amsterdam children fighting cars in 1972"
"Examining Street Life Before the Automobile"
A family strolls down a narrow street in Bhaktapur. "The Triad of City Design Failure"
"For Second-Tier European Cities, It's a Race to Go Greener, Faster"
"Locals applaud car-free month in Korean city"
"Urgent New Time Frame for Climate Change Revealed by Massive Analysis"
"Unavoidable Answer for the Problem of Climate Change"
"Utility-Scale Solar Power To Be Cost Competitive With Natural Gas By 2025"
"To Expand Offshore Power, Japan Builds Floating Windmills"
"Reclaiming Paris's River Seine quayside"
Even very old people in Bhaktapur still get around on foot. 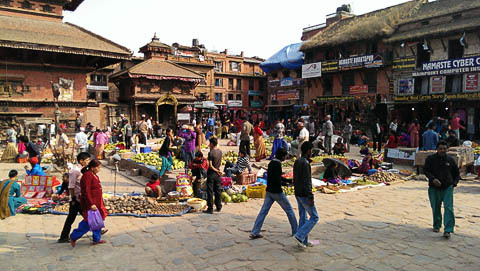 During a general strike, there were few people on Bhaktapur's streets. "Transport: Freed from the wheel"
"Cities need to improve bike lanes before reducing car traffic: report"
"Use of parking garages falls"
"Carfree Times: The complete collection of Carfree Times from carfree.com." 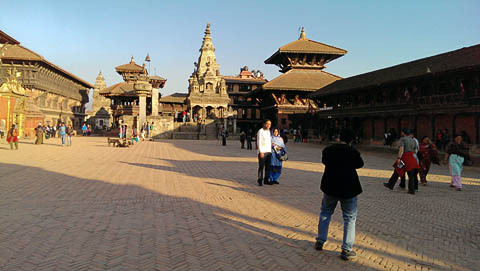 Newly-weds in Bhaktapur's Durbar Square. in my HTC One phone. No, I can't believe it either, but it's true. The next issue of Carfree Times is scheduled for March 2014. Carfree.com is wholly owned by Joel Crawford, the legal name of author J.H. Crawford. Its operation is financed by J.H. Crawford, with the help of some generous donors between 2004 and 2008. 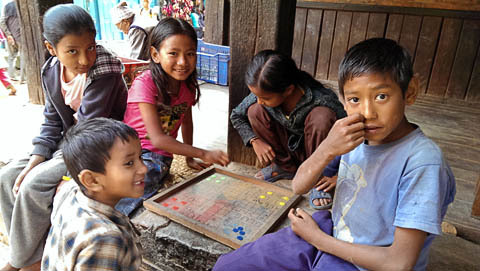 It generates no revenues directly but does help support book and photograph sales. Carfree.com accepts review copies of books but makes no commitment to review them. J.H. Crawford receives no commissions from the sale of books mentioned on Carfree.com. The views expressed at Carfree.com are those of J.H. Crawford, except for articles, letters, editorials, photographs, and films that carry the names of other authors. The inclusion of these signed texts is at the sole discretion of J.H. Crawford, who does not necessarily agree with the views expressed. All other content, except quoted material, is written by J.H. Crawford. E-mail announcements of new issues of Carfree Times are mailed to approximately 850 subscribers. A rough estimate of first-year circulation for each new issue is 5000. All the issues ever published are still being read. Carfree.com as a whole will have served 1.2 million pages and 100 GB of files in 2013.